Paul Hayward tipped back his weathered black cowboy hat and leaned up against the bar, surveying the joint with a bemused eye. Rather than the black hat of a desperado, Hayward's was the hat of a fledgling entrepreneur, pulling-off a feat that hadn’t been attempted in Oakland in quite a while — opening a country-western bar. Hayward named the bar Overland, after the 1874 saloon his restaurant now occupies. The Overland saloon was once frequented by the likes of Jack London, the area’s most famous former-resident for whom Jack London Square is named. After taking a beating during the recession, the area is rebounding in force - with new restaurants and businesses opening up, including swanky wineries and even a business selling high end yachts. 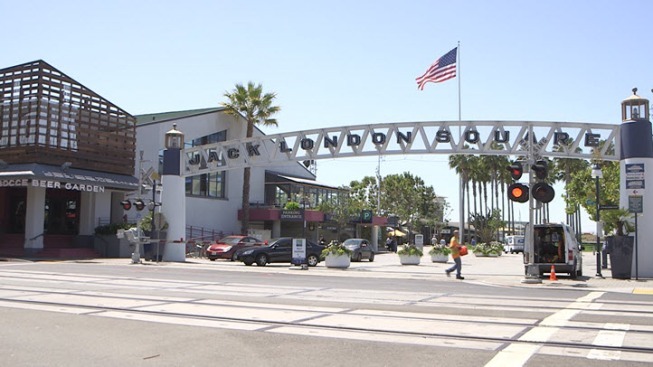 Jack London Square, the age-old waterfront destination next to the bustling Port of Oakland, is now at 97 percent business occupancy. New restaurants such as the massive entertainment center Plank have moved in, catering to an increasingly younger demographic. Plank occupies the cavernous former Barnes and Noble Bookstore, filling it with a restaurant, 18 lanes of bowling, bocce ball courts and a video arcade. Just across the water from where giant white cranes of the blue-collar port, is the winery Rosenblum Cellars where visitors exiting the ferry can settle in for a zinfandel and some stunning views of the Oakland Estuary. Oakland businessman and resident Keith Miller said the area was bustling back in 1993 when he opened California Canoe and Kayak on the square, renting kayaks and paddle boards to visitors. He said the area’s businesses emptied out during the recent recession, but are now roaring back. Miller said he typically rents hundreds of watercraft on any given weekend, filling the estuary with colorful paddle boards and kayaks. Oakland City Council President Lynette Gibson McElhaney agreed with Miller’s assessment but acknowledged the city’s struggles with crime and poverty are still a reality. The councilwoman said Oakland is indeed experiencing a renaissance, partly because of the influx of artists priced-out of San Francisco, and partly because Oakland’s image is evolving. Some of the biggest evidence of change is a new business opening on the square -- geared toward sales of high end boats, as well as motor and sailboat rentals. Longtime Oakland resident Mik Maguire opened Passage Nautical in Jack London six months ago, tailoring it to the area's maritime leanings. A statue of Jack London sits on the waterfront, an iconic reminder of the famous writer who labored on the waterfront and drank in its local bars. These days, London might not recognize the square that bears his name, but he’d still probably have a pretty good time.